Field BIM Kit : PKNail Pro : That’s my bag baby. 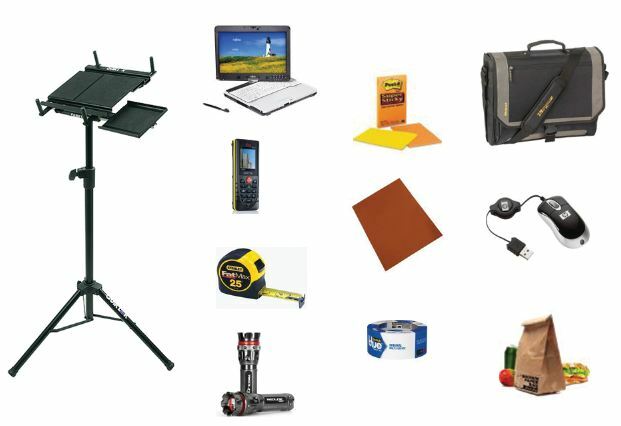 The more demos I go on, the more I get asked about our field kit, so I wanted to post what’s in my bag and what we use on a day to day basis when surveying/modeling in the field with PKNail Pro. Those of you not interested in the day-in day-out particulars of surveying buildings may want to hit your back button now… Anyway an individual equally equipped will be ready for knocking out BIM Building Surveys, and this kit, all in, costs a fraction of most other technology solutions, plus the added benefit of surveying/modeling directly in the platform you or your clients are most likely working in. However, always choose the tool/service that fits your needs. In fact, we’ll be posting shortly where we combined workflows of PKNail Pro and pointclouds. But here you go, what’s in my bag or my complete kit. So it might seem like a lot but all fits in the bag except for the tripods. The laptop tripod is excellent when mobility/portability with your gear is at a premium but I will use a laptop cart with wheels if the space allows; it is easier with wheels and has more surface area to put stuff. The real minimum you need to have with you is a laptop/tablet PC running the appropriate software, a Disto D8 or 330i, a measuring tape, and something to use for a target when needed, like an outside corner. Stickynotes (larger size) are excellent for shorter distances, a reflective Leica Target attached with Painter’s Tape is better for longer ones. Rechargeable batteries for both the laptop and Disto. I prefer an external battery pack for the laptop as it can be used on any laptop and it is self contained unlike an extra battery for a specific laptop. I like Eneloop rechargeables for devices, my preference, they come preloaded with a charge, and seem to carry it longer when not being used. You need a measuring tape on occasion for distances to short or sometimes nice to hook something with a tape when finding a distance manually. I like thick banded measuring tapes because they will extend longer without ‘breaking’ but find they are just as prone to wear down as any other so sometimes not worth the expense. LED flashlight because they are bright and do not use as much juice as others, and are always nice to have. I also have an LED light that you can wear on your head, which is my preferred. Diameter tape is a luxury but one side is graduated the other will measure the diameter of any round column which is helpful. The tripod attachment from Leica allows it to pivot properly on the its axis so the measurements stay as accurate as possible. This is great to have for exterior work when you might not have access to the interior of the building. Building chalk or a marking crayon can be helpful but usually would want to mark with painters tape or sticky pad because they are easily removed, however, the former comes in handy sometimes, especially in basements. And bring food and drink, nothing clouds your mind like being hungry, so eat.